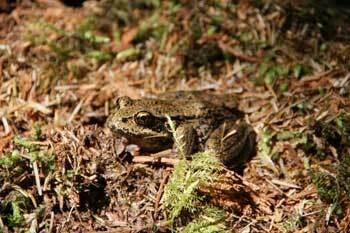 Some of the best amphibian habitat in British Columbia is found on the Sunshine Coast. Some of the best amphibian habitat in British Columbia is found on the Sunshine Coast. Unfortunately, some of the easiest accessible timber extraction also occurs in this area, due to an established set of logging roads, close proximity to Highway 101 leading to nearby log dumps. Several frogs species live in the green, moist ravines that the Sunshine Coast is famous for. Cascading, step pools, provide ideal habitat for frogs and salamanders regulating water flow and quality during the 4 seasons. All water courses on the Sunshine Coast demand extra protection as Wildlife Habitat Areas to protect them as frog refuges. Elphinstone Logging Focus (LoggingFocus) requests a stop to logging in Gough Creek, (a tributary of Roberts Creek, Sunshine Coast) by the Vancouver Island logging company, Island Timberlands (IT). The area slated for logging (Summer 2011) is identified as high-value habitat for the Coastal Tailed Frog due to key characteristics, including cool-moist forest, close proximity of 2 streams, and water flow-regulating, step pools. The frog is a Blue-Listed species on the Ministry of Environment’s Endangered species list. The Coastal Tail Frog is the oldest and most primitive frog species on the planet. 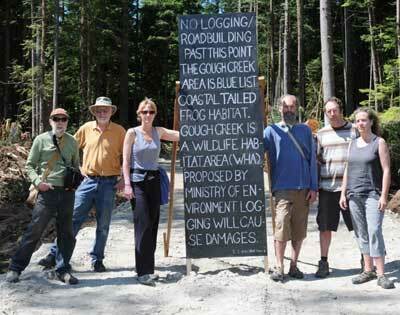 Today, LoggingFocus has erected a large sign on a logging road leading into the cutblock stating their concerns of further road-building and logging into the frog’s habitat. Ross Muirhead of LoggingFocus said that the mid zone of Gough Creek was a proposed by a government biologist as a Wildlife Habitat Area (WHA) acting as a frog refuge, but was then withdrawn when it became know that a core habitat area was on Island Timberland’s private property. Muirhead continues, “We request that these lands be considered too important to log because of the habitat needs of the Coastal Tailed Frog. In this light, we request that IT do the right thing and set aside the lands and join them up with Crown land and create the WHA. Option B would IT to defer logging until a scientific habitat study can be completed. Risk management or remediation during and post logging is not suitable when an at risk species is concerned. Blue-listed species are at risk, but not Extirpated, Endangered or Threatened. However, continued damage to their habitat may reduce population levels and move the Coastal Tailed Frog onto the Red List. These Forests Are Worth Saving and We Need Your Help.